Like many of you, I am reflecting on this year right now and thinking about what I hope for the new year. I've been thinking a lot about my vision board and how helpful it's been. This was the first year I created a vision board. I'm glad I did. I got to see where my head was at at the beginning of the year and see what has come to pass. I have it as my wallpaper on my laptop. I bring it up in conversations and of course, I blog about it. It worked so well in my life that I'm going to do it again for 2012. I was happy to see more parties and events come into my life. I even made new friends. A rarity. I received random checks in the mail. I received a lot of FREE. I kept my manicures up to date and I got an iPad! For next year's board (no it hasn't been created yet), I want to focus on 5 themes and fill the board with markers for better visualization. I'm incorporating some of what I learned from the Passion Test. 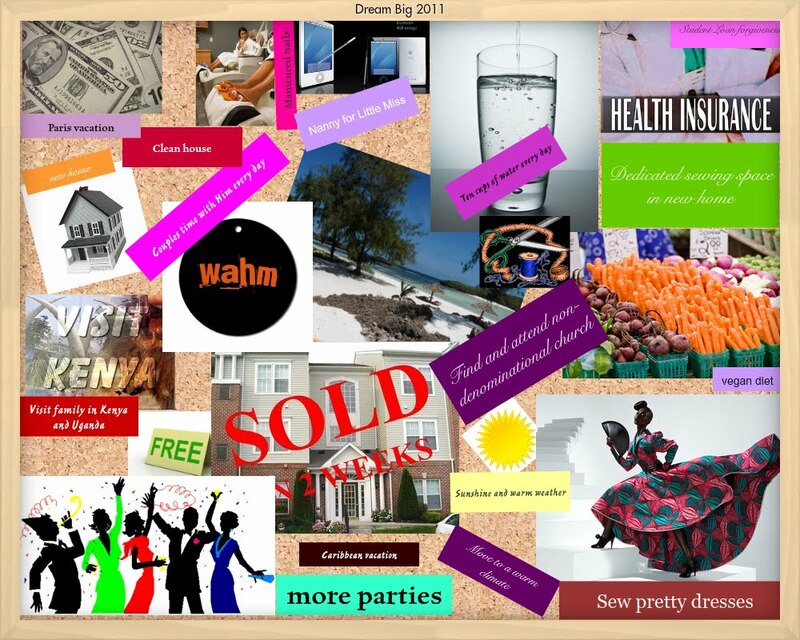 I will also use the O Dream Board again as I spend a lot of time in front of a digital screen. I'm looking forward to seeing what will manifest in 2012. The Universe blessed me abundantly this year. I am thankful. How are you designing your 2012? I wrote out my vision statement then I started to look for pictures and words from magazines. My theme for 2012 is 'intentional'. I want to be very intentional in everything that I do. We'll see how it goes! Here's to a great 2012! Great post! I just found my vision baord from last year saved on the Oprah site. This morning I did a digital board and typed out a New Years Manifesto. I just posted it on my blog. I am designing many of the goals in a list and with monthly goals listed in a new journal my sister got me for Christmas. I am all about planning and my theme is Vision. For me, instead of reacting I want to be proactive and research conferences, events and opportunities that will propel my dreams. For example, I am applying today for a Performane event that doesnt happen until October 2012 and signed up for a paper Arts Festival that is n February. I mos def need to create a new vision board, my last one was created in 2005. Granted, things from my '05 vision board are still manifesting, I need and want a fresh new vision/direction for my life. Great post, Thanks VM! This year will be about me and the Mr paying off all our debts, making more memories together as a family, getting out of the house, taking YUMMommy to the next level and improving my hustles! @Laila inttentional. I like it. Happy New Year! @Tricia I like it. Can't wait to hear about all you will do and create this year. @Nicole thanks for reading. I hope you'll be sharing your new vision. I'd love to hear it. @YUMMommy fantastic! You're going to have a great 2012. I hope you'll be sharing on the blog. Oh my goodness, I am so using the O Dream Board. My goals are so similar to yours. Living in a house in a warm climate - still trying to convince hubby to settle in Florida. I really don't want to buy our first home out here and feel... stuck. Plus homes at soooo affordable down there. Generating income on my terms - I do this now, but we are both working on more passive streams. Eating smart and getting fit - I'm slowly adapting a paleo/primal diet and as for getting fit... eh I'll get to it, lol. Spending quality time with family and friends - I want to start rekindling with friends I grew up with. I also want to do more family activities. I'm currently reading The Rhythm of Family. Go on a family cruise - This may happen some time in 2013 since this year we are working on saving $ and paying debts. I like the dream board too. I still haven't started mine for this year. I have been focused on them and already seeing positive outcomes. You're on the move with your goals/visions/dreams etc. I hope you post more on the paleo/primal diet. I'd love to hear more about it. Hubby doesn't like the warm weather?